I feel that I have finally landed in the middle stage of my watch collecting journey. Having been obsessed with Rolex for the past two years, I wasn't really thinking about much else. In fact, I had somewhat written off other brands just because I liked Rolex and it was a diverse enough brand to learn about: Vintage, precious metals, ceramics and everything in between means a lot of watches to play with. I'm the kind of person that likes being an expert at one thing, instead of knowing a little bit about a lot of things, and Rolex gives me the perfect set of timepieces to get to know. However, and as much as I am still 'ride or die' for Rolex, I respect and lust after other watches as well. Especially Audemars Piguet. They first had me when I laid eyes on the Cal.3120 22ct solid gold rotor. Even though I knew AP was a 'holy trinity' brand (alongside Patek and Vacheron, and in my opinion Breguet and A.Lange & Sohn), it was that stunning rotor which captivated me. So at the right moment, a trade came along for my Rolex President 18038 which I had been tiring of as solid gold was a little weird to wear (I'm barely in my 30s) in the startup and tech community. Sure, solid gold was fun for the occasional dinner or just wearing around the house feeling like a boss, but that quickly fades. I was planning on just selling it off, but I decided to take it down to 47th street in NYC, to Boris at Motion in Time and see if they had any interesting trades to do before I put it up in a private sale. As it happened, they had the exact AP I wanted, a rare blue dial 15300 Royal Oak, which is the slightly smaller AP which had been discontinued recently in favor of the 15400. 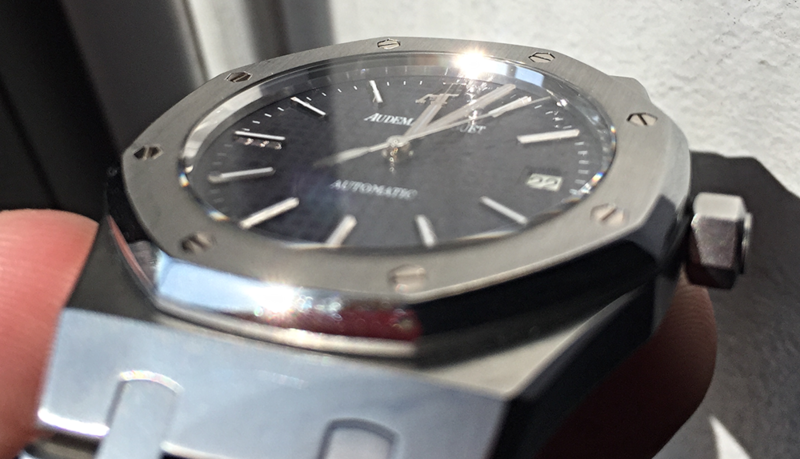 The 15400, at 41mm, was too large for me when I played with it at the AP boutique. The 15300 is becoming a very hot watch due to its sensible 39mm size, but with the display back and updated movement. I have a smallish 6.5" wrist, and although typically I'm a 40mm+ wearer, the AP Royal Oak wears very large due to the integrated lug design. The 39mm 15300 wears bigger than my Rolex ceramic submariner. Having gotten a great deal of money for the President, with a small amount of cash on top, I walked out of their store that day with my new AP Royal Oak on my arm. It also came with their two-year warranty which I am very happy about, as it has been plagued with issues. The bottom line is, you can't wear an AP like a Rolex, it is a lot more delicate. But lets talk about the watch itself before we get into the issues I've had with it. First off, the bracelet is incredible. It sparkles and glints in the light like bottled lightning. I spend time twisting it on my wrist to catch the light show whenever I have a spare moment. In addition, it is the most comfortable bracelet I've experienced in a watch. Once sized, it fits like a glove, and never catches on my many arm hairs. It also has a little bit of shape to it so it doesn't make you sweaty under the band as it has room to breathe. The clasp is also perfectly made, satisfying to clip on, and easy to pop off using the tabs on either side. I was always worried about how readable the Royal Oak was. Having played with the black dial 15400 in boutiques, it was a bit hard to differentiate the white gold markers and hands from the watch face itself. I haven't found it to be nearly the issue I thought it would be with my blue dial 15300. Sure, at night it is definitely harder to pick out the time than a sports watch, but during the day or in an office, the polished markers and hands are very readable. As for the lume, during the short time it lasts it is stunning. Something about the thin, perfectly uniform green lines gives it a futuristic quality that makes a big impact. Unfortunately, it certainly won't last all night and dims fairly quickly. I don't know if this is mostly because the lume lines are so thin or if its due to the lume AP uses, but if you wake up at 4 a.m. you will be pulling out your phone to tell the time. The Royal Oak is a watch about details, and one of my favorite ones is the high polished, two angled rehaut (interior wall around the watch face). The first time I put one of these on, I immediately noticed how much that small detail does to the watch. It adds depth and light around the dial, and has a bit of a mirror effect which creates a sunning optical illusion that makes the inside look bigger than the case could possible be. I don't know how to explain it, but I really like it, especially on the rose gold models. At first winding the watch is offputting, specifically the fact that when you screw the crown back in it seems to keep winding. I initially thought this was a mistake, until I confirmed that it is the way the mechanism is made on the AP forums. The wind comes in two stages, and I'm never really sure when it is fully wound. For a while it feels like there is no resistance, and then an awkward grinding takes over. I may be wrong, but I'm nearly certain that the resistance heavy second part of the wind isn't overwinding. However, once I got used to the winding I think it is just a quirk of very small batch movement design. And something I really love about this movement is that the date switches exactly at midnight. The finish on the watch, specifically the brushing is deep and impactful, so much so that you can feel the grooves when running your fingers across it. Like the bracelet, it manages to capture the light on it in a totally unique, almost matte way. And scratching it is more difficult than I was led to believe. That said, the bezel can be a bit of a scratch magnet after a while, but the good news is that AP service will bring it back to life, and you can always buy a new bezel after a few polishes if you choose. Which brings me to some of the mechanical issues I've had with this watch. I say all of this, fully admitting that I did not buy this watch new, but second hand. Fully admitting that the watchmaker at Motion In Time opened the watch and serviced it totally outside of AP before it got on my wrist. Fully admitting that the watchmaker did this several times to my watch after I bought it. As of the last movement service it is still running around two minutes fast each day. After a round of golf a few weeks later, I noticed the watch had stopped. I turned it over that the rotor wouldn't move. I was terrified that it had somehow crashed into the movement and would need a very expensive AP service. I took it back again, and the next morning I picked it up from the watchmaker to find out that one of the screws on the rotor was a little loose. It was now spinning freely and keeping good time. However it started running fast again, and that's how I've left it the last few weeks as I haven't had time to bring it back. So what's my bottom line on this piece? Its one of the most fantastic timepieces I've been lucky enough to own, and perhaps a brand new one or full AP service would give me a trouble free life with it, but it makes me nervous. The advise on AP has always been to know your service history and be very wary of pre-owned APs with questionable servicing. Thankfully Motion In Time was very good about their two-year waranty, fixing my issues on the spot, and if I was still unhappy, offering to cover a full AP service at Clearwater.